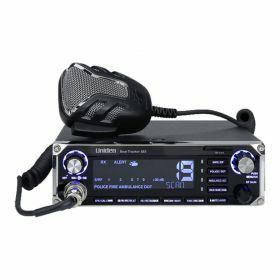 This Hybrid full featured 40 channel CB radio incorporates a Digital & Analog Scanner (VHF/UHF/700-800 MHZ) into its compact chassis. Features a large 7-color LCD display, RF/Mic gain control, built-in SWR meter, antenna check system, PA/CB switch, ANL/NB filters, instant weather with weather alert, and front mount noise cancelling black microphone with chrome mesh screen. Scanner features BearTracker warning system, text display, Digital Trunk-tracking, auto select channels with GPS allows instant access to local channels through built-in nationwide frequency data base with zip code entry. Super easy and fast access to monitor local Police, Fire, Ambulance & DOT within United States or Canada. Allows users to input individual channels and block out un-wanted channels. Free weekly data base updates. Wireless Microphone compatible with optional BC906. Approximate radio cabinet dimensions: 9" D x 7-1/4" W x 2-1/4" H.